Whenever we have eaten out during the past few months, my three-year-old has chosen to entertain herself by trapping her drink in her straw with her finger, lifting it up, then letting it fall back into the cup, over and over. Of course the question quickly becomes, "Why does the soda stay in the straw when it is lifted out of the cup, but fall back in when I slide my finger away?" The quickest solution is to answer in terms of a vacuum. The drink can not flow out until air flows in to take its place. This answer points to the concept of pressure. The pressure of the air pushing up on the drink is equal to the pressure of the drink pushing down on the air. This is surprising. No wonder three-year-old checks the result over and over. The liquid is more dense than the air, and yet it cannot fall down! Since the air and the drink in the straw are static, not moving, compared to one another, each must be experiencing balanced forces. Obviously, the sides of the straw provide balanced forces in all horizontal directions. We are worried about the vertical forces. The drink is being pulled down by gravity and pushed up by the air (There are some other forces at play, but I am ruling them negligible, do you agree?) The air is being pushed down both by the weight of the drink above it and by its own weight. What is pushing the air up? All the other air in the world! Well not quite "all", but quite a bit of it. Think about putting a lid on a cup filled just slightly too full. As you press down on the lid, the force is transfered from liquid particle to liquid particle. Finally, the particles near the straw hole are forced up and out the opening. The force applied to the lid has changes directions as it transfers through the liquid, and actually results in upward movement. The same thing is happening in the case of my daughter's straw pulled out from the cup. The weight of the air above, all of it up to outer space, is pushing down on the air in the cup just above the drink. Because the air is fluid, the downward force of the weight of the air also pushes it up into empty spaces, like the straw. 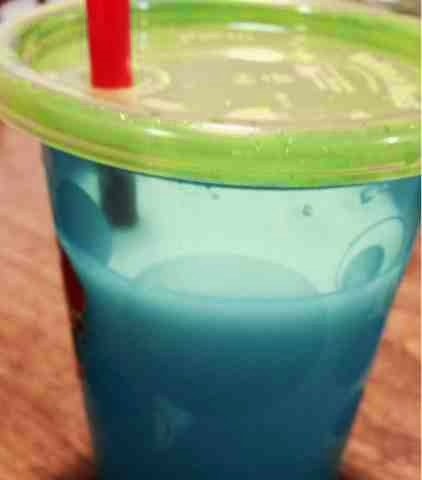 My three-year-old's finger is in the way of the air above the straw, so it can not push down on its contents. However, if she removes it, the weight of the air above the straw pushes both the liquid and the air trapped above it out of the straw. If you are familiar with fluid physics, feel free to comment on my solution. Did I miss anything? Does any one else get stumped by their pre-schooler's questions?